Successfully Added Cyber Clock - Army Style LED Watch to your Shopping Cart. 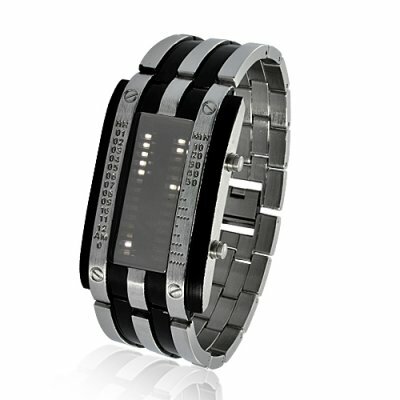 A futuristic, military style LED watch telling you the time under any harsh circumstances! If paintball, climbing giant trees, reconstruction of futuristic battles or fighting in a hailstorm are some of your preferred activities you may need such a solider LED watch that would resist any shocks and thus still be able to remind you what time it is, even after having spent the whole day in tough conditions. This super cool LED watch will accompany you during all your outstanding hobbies, giving you enough energy to overcome obstacles and mountains. Be one with the Cyber Clock, like a Jedi and his Lightsaber. Time is displayed in hidden a way every one of us would like and appreciate. There are 2 columns of small white LED lights. On the left hours are shown and on the right minutes. The date is also available with months on the left and days on the right. All the elementary information of our temporal world is indicated intelligently with bright white color. Consider that as a code only known by you, your cyber watch and eventually your brothers in cyber arms. The lifetime and attractive design are also interesting aspects. The lifetime is very long since the time only displays on your request, which will make you keep this commando watch all life long. Its appearance, similar to a dog tag, matches well with khaki clothes, special forces uniform, camouflage fatigues and so on. Perfect for all your sensational events! This army style LED watch is the new concept of trendy watches so don't miss that! Check also how much we offer it and catch the opportunity to wear it before others or resell it with profit! All this is brought to you by the online leader of wholesale awesome gadgets, Chinavasion.